ORIGINAL PAINTINGS: Grouse Ridge in Winter (Oil, 12" by 16"). LITHOGRAPHS: The Missouri Headwaters Suite, a set of 12 lithographs, 1986-1987. From the original edition of 275 with 25 artist's proofs. Each lithograph is 34" by 45". These are artist's proofs and very rare lithographs. Russell Chatham was born in San Francisco on October 27, 1939. He lived in the city until 1949 when his family moved to San Anselmo, where he spent the next twelve years. For the following eleven years, he worked and lived in Marshall, San Rafael, San Anselmo, Black Point, Bolinas, and Nicasio, earning his living as a sign painter and cabinetmaker slash carpenter. In the spring of 1972 he moved to Livingston, Montana. 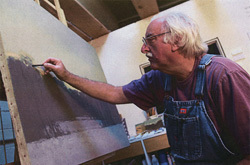 As a painter and author, Chatham is self-taught. He is the grandson of the great landscape painter Gottardo Piazzoni. He began exhibiting formally in 1958, and since then has had something on the order of four hundred one man shows at museums, art centers, private galleries, schools, colleges and universities not only throughout the west in places like Sun Valley, Aspen, Santa Fe and Denver, but also in New York, Boston, Philadelphia, Washington, D.C., Chicago, Seattle, Dallas, San Francisco and Los Angeles. His work has also been exhibited in Europe and the Orient. Chatham began printmaking in 1981, and is today regarded as one of the world's foremost lithographers.